You could also opt for a private car and driver. This last option is certainly not as cheap compared to the previous choices. Since 2014 there’s also a flight from Hanoi with an airline called Hai Au Aviation. In this case the trip takes about 45 minutes. You can also get to Ha Long Bay from Hai Phong, which is 75 kilometers away, so compared to Hanoi it’s much closer. But this depends on where you’re located. It takes more or less 2 and a half hours to get to the bay from Hai Phong. First of all, I recommend that you stay at least three days so that you can also see places that are less assaulted by tourists. Moreover, you can also stay on a boat. Depending on the company you choose for your cruise, you could also spend a night in a bungalow with a sea view on the island of Nam Ca, another of the bay’s pearls. In that way, you can take a nice walk or ecological bike ride to discover the island when you wake up. If instead you’d rather have a “normal” hotel, click here to take a look at the best hotels located near Ha Long Bay. The bay offers lots of activities, both in terms of natural excursions or active tourism. You can opt to spend hours on a kayak or just relax on the bridge of a Junk Boat, a local vessel, and enjoy this unique panorama. You can select boat tours of one, two or three days. Spend the night aboard a boat, stop at islands like Cat Bat or take in views of the bay from a seaplane: it’s a unique and different experience to enjoy the spectacular bay alone and from above. Another activity offered on excursions are visits to floating villages, pearl growers or the caves of Dau Go. Or you could also rent bikes or go trekking on the islands. The Fall is the best period for enjoying a cruise on Ha Long Bay. 3rd day: kayak the bay and a 20 minute ride in a seaplane; sunset on the boat and a Vietnamese dinner. Depending on the excursion you choose you’ll be able to see and explore more areas, even those more remote and less trampled by tourists. A cruise for one day and two nights will cost at a minimum between 40 and 80 USD. A cruise for two nights and three days could cost more than 100 USD, but will allow you to also explore places further from the port. Usually prices include food and lodging as well as a transfer to and from Hanoi or other places. Note that we’ve cited only the cheapest cruises. Obviously there are much more expensive ones! What’s there to see in Halong Bay? Cat Ba Island is the largest in the bay. The island is a bit overrun by mass tourism like the rest of the bay, and in some places there are buildings that are not completely in harmony with the rest of the landscape. However a tour of its jungles and its streets is obligatory, From here you can take in magnificent sunsets on the bay and the boats of fishermen that live on Cat Ba, and even see the lovely women looking for oysters or other fish for their supplies wading in knee-deep water. 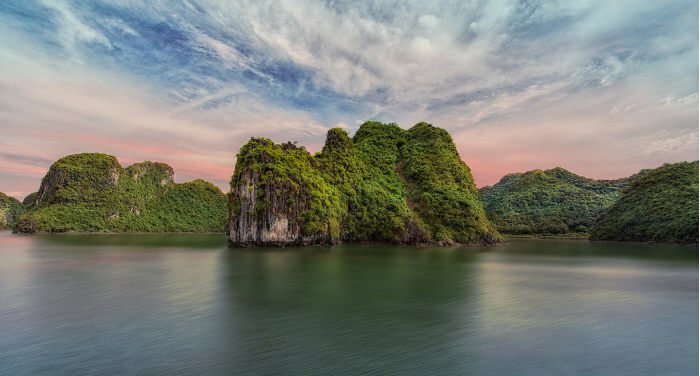 The term Ha Long indicates “where the dragon goes into the sea” and the reference is quickly revealed. It is said that a dragon, while coming down from nearby mountains, created the bay with its large tail, with which it dug out holes and hollows. Between the water and these hollows all that remains visible are the peaks that correspond to the islands.